As young kids, we all had our favorite posters adorning our rooms. From motorcycles to kittens to Justin Bieber photos… for which the coming years will hold guilt and embarrassment. Thanks to my hippie parents, I had Peter Max posters. In fact, I had a Peter Max room! While I loved the Beatles and Yellow Submarine (which was inspired by Max’s work but not done by him), sleeping in a psychedelic room made me the man I am today and please withhold the wisecracks, my longtime friends! Sure, just try sleeping with über-bright yellows, pinks and oranges glaring through the dark. There was no need for a night-light as the vibrant glow kept me safe from the boogeyman but afraid of longhair love children, sitting in the corner of my room with bongs bubbling. Years later I would discover it wasn’t some childhood phobia but actual friends of my parents smoking pot in the wrong room. Yet something else, considering the second-hand weed smoke, that made me the man I am today. Again… hold off on the comments. But Peter Max’s work was exciting. It was fresh and innovative and led a generation — the love generation, to be exact — with visuals and messages that are still adored and worshipped today. Several days after I planned writing this article, I noted that Mr. Max would be appearing at a local gallery. Fortuitous? Karma? Too much second-hand smoke from “Uncle Bongchild?” Whatever it was, I made sure I was there to speak with him and get a few quotes. There is a bit of confusion about Max’s actual date of birth, according to several biographies around the web. Some say 1937 and others say 1939. Considering the fact that his family, German Jews, fled Nazi Germany after he was born, the date may be earlier. The official bio on his website gives no date, so I would rather respect his obvious wish to have no date and judging by the man with whom I spoke, I believe numbers are not very important to him. During my interview with Peter, he did make a point of artists learning to move their wrists for the best training in rendering and control. What’s The Real Story Behind The Man and The Myth? There are many different bios about Mr. Max that dot the internet and they all vary slightly, so only Peter knows what is really true. The point to this writer’s look at Peter Max as a creative is to inspire the readers by his lessons on creative thought and application. Peter’s art was groundbreaking. That’s a hard position to be in. When you are the first, you face the doubters, the naysayers and the conservative mindset that makes expressing your love for what you believe in an uphill battle. In all the biographies that one can read, it’s obvious that Peter’s parents supported his creativity and encouraged it. In a time of war and turmoil, moving from the threat of extermination under the Nazis to Shanghai under the control of the Imperial Japanese army during the brutal days of the Second World War, then to a young State of Israel, surrounded by enemies bent on destroying each and every citizen, Peter had to be aware of the tensions around him. It was probably the love and protection of his parents that made those years not so frightening for him. Throughout it all, there was art in which to immerse himself. Perhaps it was the world that he best knew and it gave him comfort. With his family moving to Brooklyn, New York in the early 1950s, Peter was now part of a city that celebrated art and gave him many avenues to grow as a professional. His earliest work to gain attention was collages of photographic images, and it won a gold medal from the Society of Illustrators in 1962. The 1960s saw big cultural changes. The sexual revolution, the nightly broadcasts of the war in Vietnam, “doves and hawks,” “tune in, turn on, drop out,” “make love, not war” burning bras and draft cards and the growth of casual drug usage — it all happened very fast and people sought to find other “planes of reality.” It wasn’t just acid trips… it was a way to free themselves from the uptight 1950s with the frightened attitudes of the cold war and a possible threat of nuclear war, communists and space aliens… which were less feared than communists. The beat generation of the 1950s was too quiet. Bongos, MAD Magazine, Kerouac and Ginsberg were too fringe at the time to threaten the American way of life. Max and his contemporaries were actually changing things. But the generation of freedom and “marching to one’s own drummer” also had a certain hipness that was an insistence of “being in.” If you weren’t “with it” you were a “square.” Fashions and causes change but people will always be people. With Max’s upbringing and art being his world of creativity and peace, I suspect it insulated him against growing up at a time when non-creatives committed unspeakable acts against humanity. His art was everything – his number one reason for being. When I saw that Peter would be at the Ober Anderson Gallery in Clayton, Missouri, I tried to arrange a meeting so I could ask a few questions for this article. My biggest quandary was what questions does one pose to an iconic talent whose work spans decades? The usual questions have been asked and answered dozens of times. I wanted to find answers to questions that would be relevant to what creatives face today. I wanted gems from the master that would change lives and thinking. I had expected a few minutes of Peter’s time in the gallery but was delighted when he suggested we sit at a sidewalk café to chat. I assured him I would only ask two or three questions, as I knew he was busy. “Ask four or five or more” he replied, with a genuine smile. If you consider the generation who fought the status quo, the establishment and old mainstream thinking, Max’s foray into licensing his work may have seemed too commercial for the current art movement at that time. Was Max “selling out” to the establishment or using consumerism to spread the message of his art? His art adorned clocks for General Electric, school book covers for Mead, airplanes, postage stamps, work for six American presidents, among too many projects of shear importance to mention in just one article. I was curious about what brought him into licensing his work. Not even Norman Rockwell, who was America’s darling artist from the 1940s through the 1980s, had done it before. Did Max see potential in consumerism or was it just an extension of his art and the tools with which he experimented? He also mentioned his work in the spiritual community. Mr. Max, it turns out, was the force behind the Satchidananda Ashram, affectionately known as “Yogaville,” in Buckingham, Virginia. If you are in the area, make time for a visit and mention his name. Someone from the gallery rushed out to inform Peter that he was needed in the gallery right away but he politely replied that he would be there once he was done with my interview. The graciousness and consideration overwhelmed me! I did, as I had promised, keep the number of questions down to three. With only one question left, I asked what advice he had for designers to help their creative thought. What did he think about the belief that creatives had to have a certain “style” for which they are known? How Does This Translate to THIS Generation? It was never success or money Max was after – it was always about the art. Sure, he made millions and will continue to make money but if you hear his words, it falls behind his love for creativity. As with his words on drawing, until “it comes,” keep loving your creative projects and the money will come. If not, at least you’ll love what you’re doing. I have to take credit for that afterthought. Look for opportunity in technology and marketing. Consumerism was a bit more innocent in the 1960s, if “innocent” can be used as a descriptor, but as rampant as consumerism is, why not use it? With digital technology evolving every day, there are always avenues open for creativity. Get inspired by Max’s words and life! Yes, we may not want to actually draw on paper, but Peter is not the only great artist to encourage others to draw every day. Picasso was also quoted as saying one should draw every day. No matter what tool you use to create, practice makes perfect and mistakes, or “bad drawings,” as Max refers to it, hold lessons that lead us to become better at creating great pieces, designs, websites, etc. It’s hard, if not impossible, to fathom such thoughts as “unity” and “harmony” in our generation as we rebel against our parents of the love generation and live behind the “me first” generation of entitlement. There are great lessons in Peter Max’s words, as well as his career. If you check the Peter Max website you’ll find, among other words of wisdom that inspire, a schedule of his exhibits and personal appearances. I highly suggest you go to one and meet the man. You will find a gracious, kind and humble man who will be happy to shake your hand and take a few moments to chat with you. You will come away from it feeling better about being a part of the creative community and inspired about starting a new day with a new outlook. Love Peter Max and love your articles! Fab pics, too (I had scarves and stationery with many of those images on them … fond memories). How lucky that you had the opportunity to meet this iconic artist! Looking forward to your next piece …. Great article, Peter max was certainly an inspiration for me growing up. I met Peter Max once in the 1980’s at a Dallas Show of his art. He was very personable and happy to spend time talking. It was a great experience! Kaboom, fantastic new take on Max. You really should consider a biographical book on him in your inimitable writing style. It would be great! Your profession, background and writing would do justice to an iconic time in American graphics and business! Do it!! Really good stuff. Congratulations! Really a Great article! Thanks Speider Schneider. I too love Peter Max’s work and was happy to read this interesting piece about Peter Max, the man. To me, his art is happy – the colors, the shapes, the images – pure joy and whimsy. Yeah, Speider’s interaction with Peter spoke volumes about the man himself, confirming much of what we get from his colorful, imaginative works. I grew up with Peter Max art in my room too. Still adore his art and his total art vibe. 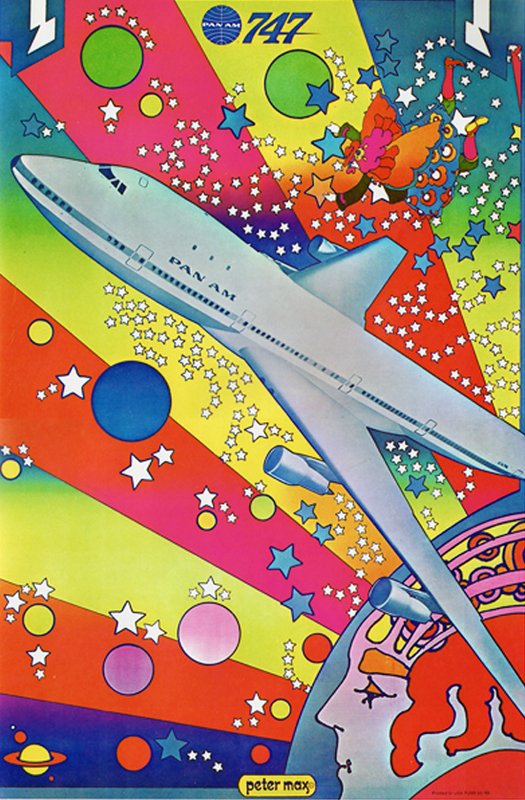 Influenced me also as an artist, but mostly Peter Max images just make me happy when I look at them. every time. what more could you ask. Peter, I think it is lovely you are still doing what you do. Peter and I actually chatted about that and he did mention being too busy to go to London for the nine months they wanted for production but he didn’t bring up that he did the original art. He did bring up that the artist who did the final art for the film was referred to as the “Peter Max of Europe” and that they became friends. I have to assume Peter is a very humble man who doesn’t really talk about his accomplishments that much. Humility is part of the love generation, I guess. addition to my comment above… Really amazing website!!! Thank you for sharing all of this!!! Thank you for an inspiring article on an artist I knew relatively nothing about other than loving his images when coming of age in the 60’s. Amid all the destructive social upheaval of that time were the paintings and posters I had in my own bedroom and all the welcome images he had licenced all around us which reflected a bright illusionary optimism only found within the free love mindset of the hippie generation. 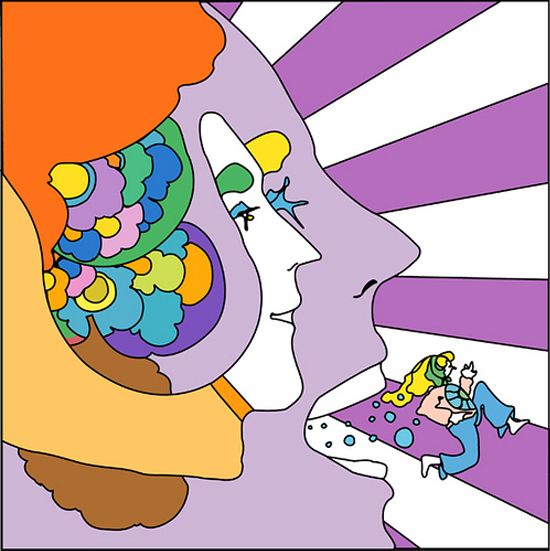 Peter Max’s paintings engendered a visual calm that felt similar to the musical calm of Donovan, Melanie, and a few others individual songs of that era. Need I say how much I loved the funny satirical content of MAD Magazine, never missing an issue for years on end? Thank you for your early work and this wonderful article on a favorite artist, Whiskers. 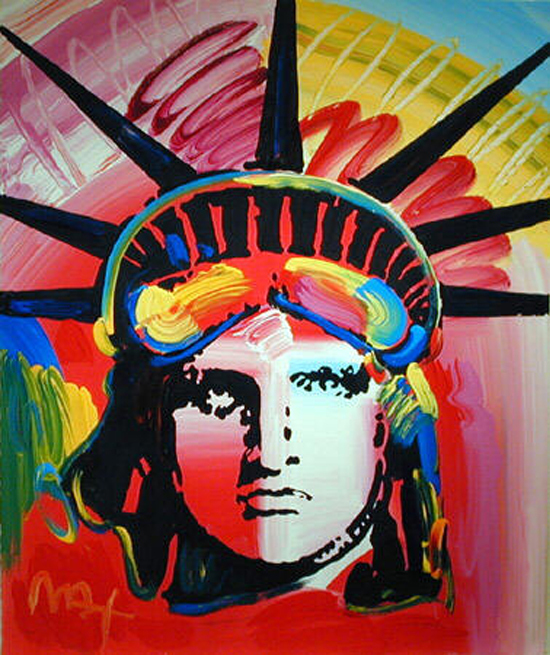 i like the painting of the lady of liberty it is very colorful and abrtact great job max!!! Hey Speider, great interview and article!